Fletcher gets big bonus points for taking his desk setup shot with OSXDaily.com open in Safari! 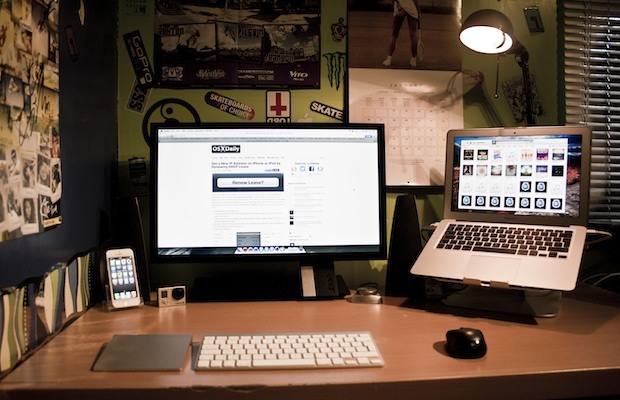 Rad, looks like my desk in college. Why no Magic Mouse?! Ruins the entire setup! Why have these articles become so poor? Surely there are some worthwhile setups out there worth posting. A MacBook Air and no hard drive have has enough juice to do what an hour of video?! + The processor and 8gb of ram on a MacBook Air would be like murder to work with video no? Notice the “Amateur” part in the headline? Sorry my setup is “poor” but i am 15 and my only form of income is a paper round, so i can not afford the best products. Also i do have a external 500GB hardrive. Your setup is not “poor” – don’t let people like Ted get you down. If you read the comments regularly you’ll see that just about every post features one or more comments from someone just like Ted. Oh, and Ted – if you read this … why don’t you post the specs on your setup here for us to “critique”??? Hey Ted, you’re a real jerkwad. I’m a working professional and guess what? This setup is practically identical to mine. Good style, good Mac. I like this one. Would kill for this setup when I was 15. I like it, simply and clean with room to grow. Love this setup, more like this please! I love it!! It’s my dream! Are you only 15!? Wouuuuu so jealous! Thanks it took me a long time to save up for it, and thanks for all the compliments. It was what was on when i decided to send it in, i didn’t really think of that to be honest. Simplistic, I wish i had a setup this beautiful and tidy.